Breastfeeding a sick baby can be challenging. Some babies refuse to nurse because of a sore throat or an ear infection, which can make nursing uncomfortable for them. This special moment between a mother and child is important, especially when the child is sick. A mother’s breastmilk is the best medicine for her child. Mothers sometimes become discouraged from breastfeeding because of how difficult it is when the baby is sick and fussy. Here is some information on breastfeeding when your baby is sick. Breastmilk provides antibodies that fight off illnesses, and it is easily digested. In fact, it is easier to digest and absorb for a baby than formula. If your baby is refusing to nurse, you should try different nursing positions. Try a position where the baby is held upright. Don’t stop offering breastmilk. Continue to try to get your baby to drink breastmilk for at least an hour. Offer your sick baby breastmilk in a different form, such as frozen momsicles. You can also try adding breastmilk to solids if your child is over 6 months. For babies who are suffering from a stomach bug, breastmilk is good for treating diarrhea. Not only is breastmilk easier to digest, but it is also easier for a sick baby to keep down. Diarrhea causes dehydration, which is why breastfeeding more often during this time is essential. Babies with congested nasal pathways may benefit more from nursing in a steamy bathroom with the hot water running. Before you nurse a congested baby, you should try to remove mucus from his or her nose. Keeping your baby’s sore throat lubricated will help in the healing process. Because of this, it’s best to offer your breastmilk frequently. Cool liquids are more soothing to babies with sore throats. In this case, a momsicle would be good alternative for your sick baby. Contact Pediatric Partners if you are concerned about any of your baby’s symptoms or need any information on breastfeeding. Breastfeeding a sick baby can be draining. 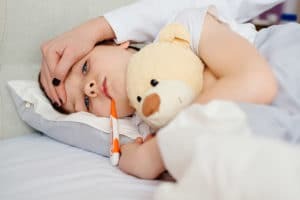 Don’t forget to take care of yourself while dealing with the stress of caring for your sick child. Pediatric Partners now has three locations to better serve our patients. The Evans office is located at 411 Town Park Blvd., the downtown Augusta office is located at 1303 D’Antignac Street, Suite 2600, and the new Grovetown office is located at 5135 Wrightsboro Road. For more information about Pediatric Partners, please feel free to call the office at 706-854-2500, visit pedpartners.com, or follow the Pediatric Partners of Augusta Facebook page.